I've realized having more skulls than the enemy team makes your golem stronger, but is a 55 skull golem weaker than a 100 skulls golem? I've analysed a replay and came to these preliminary conclusions. 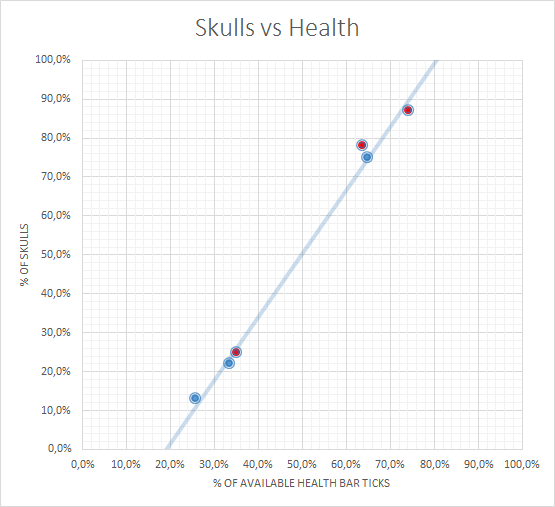 TL;DR: I'd estimate 20% base damage/HP, with the other 80% coming from skulls. Defense: golems have equal base HP (about 20% of its max HP for 100 skulls), and the rest of golem HP comes from an "pool" of HP, divided linearly based on number of skulls. Attack: similar, with a small base attack number for each golem, and additional damage divided linearly based on number of skulls. In addition, there seem to be "rounds": each subsequent "round" of golems will be stronger in absolute numbers (HP and damage wise). Finally, the time mines have been opened also has some influence on golem health and damage, although that has recently been capped from the moment 4 minutes have passed or at least 60 skulls having been collected. See these patch notes for details. I have not been thorough enough for this to be acceptable on our statistics sister site, but based on experience and gut feeling I'd say this trend line is close to the real thing. A similar thing can be done with offense. If you observe the health of the same building (e.g. a wall) drop for golems of different strength, a graph could also be plotted. Left / 87 skulls: 13% damage on a wall per hit. Right / 13 skulls: 5% damage on a wall per hit. If anyone wants to collect more / more precise data, I welcome them to add it to this answer. But perhaps we should wait until we can (/ know how to) use the combat log :-).